March 1 Update: The preliminary monthly climate report for February confirms a snowfall of 20.9" for the Feb. 25-26 storm and 36.9" for the month. 6 PM Update: Another 0.1" has fallen later this afternoon, bringing the February total to 36.9". The average temperature so far this month in Central Park is 33.1°, or 1.2° below normal. This is nearly 5° warmer than in 2007 when 3.8" or barely 10% as much snow fell. Total precipitation, however, is more than double the normal for the month. BREAKS THE OLD RECORD OF 27.9 INCHES SET IN 1934. 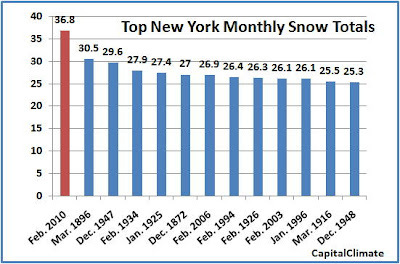 RECORD FOR SNOWIEST MONTH WAS 40.2 IN JANUARY OF 1978. AS THE 5TH SNOWIEST SEASON ON RECORD. Note that the average temperature so far this month has now increased to 26.1° (3.9° below normal). This is over 5° warmer than in 2007, when just over one-third as much snow fell. The largest daily total of 11.4" fell on Feb. 5, a day which averaged above freezing and 5° above normal. The National Weather Service announced within the last hour that Pittsburgh has broken its record for snowiest month ever (measurements began in 1884). The 0.8" of snowfall today from the back edge of the powerful storm pounding the northeast has pushed the total for February to 40.8", just over the previous record of 40.2" in January 1978. Several more inches of snow accumulation are forecast for tonight, Friday, and Friday night. AS THE 8TH SNOWIEST SEASON ON RECORD. INCHES, AND APRIL 1.5 INCHES. See Mediarology for the latest developments. Midnight Friday Update: Bob Ryan made an emotional "final weekend forecast" and farewell to his audience and colleagues Jim Vance and Doreen Gentzler around 12:20 Saturday morning at the end of the Olympics-delayed local news broadcast. Although he made no mention of future plans, dcrtv.com reported on Thursday that Ryan's speculated move to Channel 7 (WJLA) may be delayed by a contract non-compete clause. Such restrictions can potentially run as long as 6 months. The dcrtv blog reports that veteran weatherman Bob Ryan will be leaving NBC affiliate WRC-TV (Channel 4) on Friday after 31 years at the station. Ryan's departure, announced as a retirement, leaves open the possibility of his joining forces with long-time weatherman Doug Hill at ABC's WJLA, Channel 7, although no deal has been announced. Ryan, the dean of Washington TV meteorologists, has always been a class act since the Climate Capitalist first viewed his weathercast on WCVB-TV shortly after Ryan began his career in Boston. Bob Ryan has been News4’s Chief Meteorologist since 1980 making him the longest-serving weathercaster in Washington. His weather reports air weekdays on News4 at 5, 6 and 11 and on NBCWashington.com. And, listeners to NPR affiliate WAMU-FM can hear Ryan’s forecasts afternoons during All Things Considered. Ryan’s career began in Cambridge, Mass. where he was involved in cloud physics research with Arthur D. Little, Inc. A side job as a broadcast meteorologist turned into a fulltime job as principal meteorologist for Boston’s WCVB-TV. In 1978, Ryan became the first meteorologist to regularly appear on NBC’s Today show. 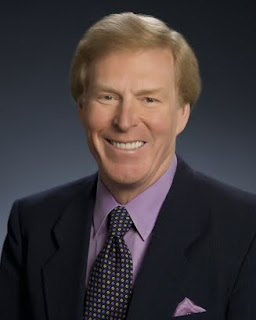 As Chief Meteorologist, Ryan has initiated and supported many unique programs at NBC4. For 25 years, his annual Almanac provided weather and environmental information while raising more than $500,000 for local children’s charities. He also created the 4WINDS (Weather Interactive Demonstration Schoolnet) Network that placed more than 400 interactive weather stations in area schools. In 2006, that system was upgraded and expanded to become Weather Plus Neighborhood Network. Hundreds of thousands of kids who grow up in the Washington area enjoy a hands-on introduction to meteorology from these systems. Ryan was also co-investigator for a project that brought NASA and NBC4 together to lead one of the first television weather sites on the Internet, WeatherNet4. Today, NBC4’s strong web weather presence takes the shape of weatherplus.com, a website and a cable channel which provides round-the-clock forecasts and weather information. During his career, Ryan has received numerous awards, including regional Emmys for Weathercasting and the Ted Yates Emmy for outstanding service to the community. His alma mater, the University of Albany, presented him with a "Distinguished Alumni" award, and the AMS gave him The Charles Franklin Brooks Award for his outstanding service. Despite these awards and his distinguished career, Ryan is proudest of his role as husband and father. He and his family reside in Northern Virginia. Bob Ryan has been an important fixture in our newsroom for 31 years. He has covered everything from tornadoes to hurricanes and of course the occasional blizzard. Millions of area residents have come to depend on his forecast. After much discussion with him, Bob has decided it is time for a change. So Friday will be his last day at NBC4. We can't thank him enough for his dedication and passion. He will certainly be missed. Bob asked me to share the following note with you: "Even for a snow loving meteorologist this has been some winter. And for this snow loving and every other kind of weather loving meteorologist this has been some ride. It’s also been more fun than one person should have over 30 years in the same job with some of the same friends and colleagues for 20-30 years. But this winter’s snows are now pausing and so will I. Yogi Berra said, 'When you come to a fork in the road take it.' I’m going to take that great philosopher’s advice. This fork leads to more time with my wonderful wife Olga, who has had to deal with more storm related power outages and unshoveled walks alone than any spouse should ever have to put up with. I have had the wonderful fortune to work for and with many of the most dedicated people I know, who care deeply about what we do and why we do it. I may not have the opportunity after Friday to sit next to Doreen, Vance, Wendy, Jim or have the fun of interacting with my long time colleagues Tom, Veronica and Chuck and so many of you. But I will always have great affection for everyone here and you will be in my thoughts as you have been part of my professional life. If anyone asks, tell them let’s meet upstairs at Guapo’s when the snow melts, after this winter we all need a beverage and I know I still owe Collins another Jameson"
Feb. 22 AM Update: A remaining snow depth of 1" this morning gives Washington 21 days in February with snow on the ground, breaking the record from 1934. The average snow cover for the month is now 9.8". Dulles has a snow depth of 5", and BWI is at 3". Feb. 22 Update: A high temperature of 50° on Sunday led to 2" more of melting, but 2" of snow remains on the ground at 1 am, virtually assuring that the record will be broken 6 hours from now. Dulles is at 5", and BWI has 3" of snow on the ground. Feb. 21 AM Update: Today's 4" snow depth ties 2010 with 1934 for the record highest number of February days (20) with snow cover since 1930. Average snow depth for the month so far is 10.2". Feb. 20 AM Update: Temperatures remained above freezing overnight for the 3rd consecutive day, but snow depth declined only 1" to 6" on day 19 of February snow cover. This puts 2010 into a tie with 1979 for 2nd place. Average snow depth for the month so far is 10.6". Snow depth at Dulles is 8" and BWI is at 6". Feb. 19 AM Update: Day 18, snow depth 7". This year is now in sole possession of 3rd place, one day away from 1979. Feb. 18 AM Update: This morning's snow depth is 9". This February's count of 17 days with snow on the ground is now tied with 1961 for 3rd place. With a late January snowstorm and two monster February storms, Washington, DC has now had measurable snow on the ground for 16 out of the first 17 days this month. This morning's measurement showed a remaining depth of 10" after reaching a high of 21" on the 11th. 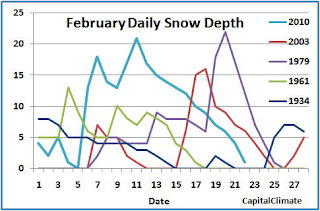 A CapitalClimate analysis of daily data since measurements began at or near the current National Airport location in 1930 shows that 2010 has now tied with 2003 for the number of days in February with 1" or more on the ground. That puts this year tied for 4th place, behind 1961, 1979, and 1934. Barring an unforeseen meltdown, the 1961 3rd place record of 17 will be tied tomorrow. With temperatures expected to remain in minimal melting territory through the rest of the week, the 80-year record of 20 days in 1934 could be tied on Sunday the 21st.